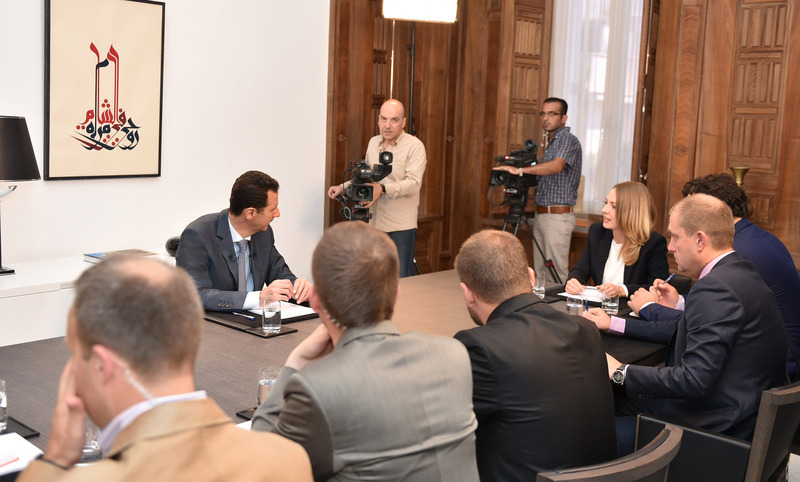 "If you are Worried about the Refugees, Stop Supporting Terrorists"
President Bashar al-Assad gave an interview to Russian media outlets, following is the full text of the interview, which was conducted in English and Arabic. Below is the RT video recording of the interview. It is important for Americans and Europeans to listen carefully to president Assad’s responses, his understanding of the causes and consequences of terrorism, of the process of State sponsorship of terrorism by the US and its allies. If you are worried about the refugees, stop supporting terrorists. If I jump to the last part, because it’s related to this one, is it possible to achieve anything taking into consideration the prevalence of terrorism in Syria and in Iraq and in the region in general? We have to continue dialogue in order to reach the consensus as I said, but if you want to implement anything real, it’s impossible to do anything while you have people being killed, bloodletting hasn’t stopped, people feel insecure. Let’s say we sit together as Syrian political parties or powers and achieve a consensus regarding something in politics, in economy, in education, in health, in everything. How can we implement it if the priority of every single Syrian citizen is to be secure? So, we can achieve consensus, but we cannot implement unless we defeat the terrorism in Syria. We have to defeat terrorism, not only ISIS. I’m talking about terrorism, because you have many organizations, mainly ISIS and al-Nusra that were announced as terrorist groups by the Security Council. So, this is regarding the political process. Sharing power, of course we already shared it with some part of the opposition that accepted to share it with us. A few years ago they joined the government. Although sharing power is related to the constitution, to the elections, mainly parliamentary elections, and of course representation of the Syrian people by those powers. But in spite of that, because of the crisis, we said let’s share it now, let’s do something, a step forward, no matter how effective. Regarding the refugee crisis, I will say now that Western dealing in the Western propaganda recently, mainly during the last week, regardless of the accusation that those refugees are fleeing the Syrian government, but they call it regime, of course. Actually, it’s like the West now is crying for the refugees with one eye and aiming at them with a machinegun with the second one, because actually those refugees left Syria because of the terrorism, mainly because of the terrorists and because of the killing, and second because of the results of terrorism. When you have terrorism, and you have the destruction of the infrastructure, you won’t have the basic needs of living, so many people leave because of the terrorism and because they want to earn their living somewhere in this world. So, the West is crying for them, and the West is supporting terrorists since the beginning of the crisis when it said that this was a peaceful uprising, when they said later it’s moderate opposition, and now they say there is terrorism like al-Nusra and ISIS, but because of the Syrian state or the Syrian regime or the Syrian president. So, as long as they follow this propaganda, they will have more refugees. So, it’s not about that Europe didn’t accept them or embrace them as refugees, it’s about not dealing with the cause. If you are worried about them, stop supporting terrorists. That’s what we think regarding the crisis. This is the core of the whole issue of refugees. Question 2: Mr. President, you touched on the subject of the internal Syrian opposition in your first answer; nevertheless, I would like to go back once again because it’s very important for Russia. What should the internal opposition do in order to cooperate and coordinate with Syrian authorities to support them in battle? This is what they are saying and what they intend to do. How do you see the prospects of Moscow 3 and Geneva 3? Will that be useful for Syria in the current situation? President Assad: As you know, we are at war with terrorism, and this terrorism is supported by foreign powers. This means that we are in a state of complete war. I believe that any society and any patriotic individuals, and any parties which truly belong to the people should unite when there is a war against an enemy, whether the enemy was in the form of domestic terrorism or foreign terrorism. If we ask any Syrian today about what they want, the first thing they would say we want security and safety for every person and every family. So, we as political forces, whether inside or outside the government, should unite around what the Syrian people want. This means that we should first unite against terrorism. This is logical and self-evident. That’s why I say that we have to unite now as political forces or government or as armed groups which fought against the government in order to fight terrorism. This has actually happened. There are forces fighting terrorism now with the Syrian state, which had previously fought against the Syrian state. We have made progress in this regard, but I would like to take this opportunity to call on all forces to unite against terrorism, because it is the way to achieve the political objectives which we as Syrians want through dialogue and political action. Intervention: Concerning Moscow 3 and Geneva 3, in your opinion, are there prospects for this endeavor? President Assad: The importance of Moscow 3 lies in the fact that it paves the way to Geneva 3, because the international sponsorship in Geneva was not neutral, while the Russian sponsorship is. It is not biased, and is based on international law and Security Council resolutions. Second, there are substantial differences around the “transitional body” item in Geneva. Moscow 3 is required to solve these problems between the different Syrian parties; and when we reach Geneva 3, it is ensured that there is a Syrian consensus which would enable it to succeed. We believe that it is difficult for Geneva 3 to succeed unless Moscow 3 does. 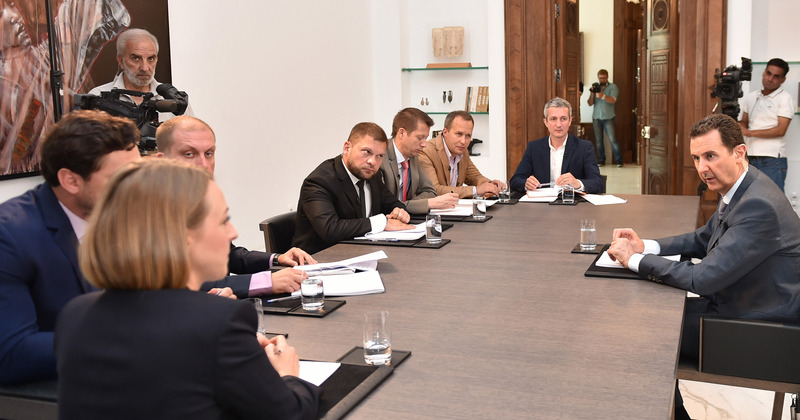 That’s why we support holding this round of negotiations in Moscow after the preparations for the success of this round have been completed, particularly by the Russian officials. Question 3: I would like to carry on with the issue of international cooperation in order to solve the Syrian crisis. In this regard, it is clear, after solving the Iranian nuclear file issue, that Iran will play a more active role in the region’s affairs. In this context, how do you evaluate the recent Iranian initiatives concerning reaching a settlement for the situation in Syria? And in general, what is the importance of Tehran’s support for you, is there military support? And in case there is, what form does it take? President Assad: At present, there is no Iranian initiative. There are ideas or principles for an Iranian initiative based primarily on Syria’s sovereignty, the decisions of the Syrian people, and on fighting terrorism. The relationship between Syria and Iran is an old one. It is over three and a half decades old. There is an alliance based on a great degree of trust. That’s why we believe that the Iranian role is important. Iran supports Syria and the Syrian people. It stands with the Syrian state politically, economically, and militarily. When we say militarily, it doesn’t mean as claimed by some in the Western media that Iran has sent an army or armed forces to Syria. This is not true. It sends us military equipment, and of course there is an exchange of military experts between Syria and Iran. This has always been there, and it is natural for this cooperation to grow between the two countries in a state of war. Yes, Iranian support was essential to support Syria in its steadfastness in this difficult and ferocious war. Question 4: Concerning the regional factors and actors, you recently talked about security coordination with Cairo in fighting terrorism, and that you are in the same battle line in this regard. How is your relationship with Cairo today given that it hosts some opposition groups? Do you have a direct relationship or perhaps through the Russian mediator, particularly in light of the strategic relations between Russia and Egypt. President el-Sisi has become a welcome guest in Moscow today. President Assad: Relations between Syria and Egypt have not ceased to exist even in the past few years, and even when the president of Egypt was Mohammed Morsi who is a member of the terrorist Muslim Brotherhood organization. Egyptian institutions insisted on maintaining a certain part of this relationship, first because the Egyptian people are fully aware of what is happening in Syria, and second because the battle we are fighting is practically against the same enemy. This has now become clearer to everyone. Terrorism has spread in Libya, Egypt, Yemen, Syria, Iraq, and in some other Arab countries, and in some Muslim countries too like Afghanistan, Pakistan, and others. That’s why I can say that there is joint vision between us and the Egyptians, but our relationship exists now on the security level. There are no political relations, i.e. there are no contacts between the Syrian Foreign Ministry and the Egyptian Foreign Ministry, for instance. Contacts are done on the security level only. We understand the pressures that might be applied on Egypt or on both Syria and Egypt so that they don’t have a strong relationship. This relationship does not go, of course, through Moscow. As I said, this relationship has never ceased to exist, but we feel comfortable for the improvement in relations between Russia and Egypt. At the same time, there is a good, strong, and historical relation between Moscow and Damascus, so it is natural for Russia to feel comfortable for any positive development in relations between Syria and Egypt. Question 5: Mr. President, allow me to go back to the question on fighting terrorism. How do you look at the idea of creating a region free of ISIS terrorists in the north of the country on the borders with Turkey? In this context, what is your comment on the indirect cooperation between the West and terrorist organizations like al-Nusra Front and other extremist groups? And with whom are you willing to cooperate and fight against ISIS terrorists? President Assad: To say that the borders with Turkey should be free of terrorism means that terrorism is allowed in other regions. This is unacceptable. Terrorism should be eradicated everywhere; and we have been calling for three decades for an international coalition to fight terrorism. But as for Western cooperation with al-Nusra Front, this is a reality, because we know that Turkey supports al-Nusra and ISIS by providing them with arms, money, and terrorist volunteers. And it is well known that Turkey has close relations with the West. Erdogan and Davutoglu cannot make a single move without coordinating first with the United States and other Western countries. Al-Nusra and ISIS operate with such a force in the region under Western cover, because Western states have always believed that terrorism is a card they can put in their pocket and use from time to time. Now, they want to use al-Nusra just against ISIS, maybe because ISIS has gone out of control one way or another. But this doesn’t mean that they want to eradicate ISIS. Had they wanted to do so, they would have been able to do it. For us, ISIS, al-Nusra, and all similar organizations which carry weapons and kill civilians are extremist organizations. But with whom do we conduct dialogue, is a very important question. From the beginning, we said that we engage in dialogue with any party if that dialogue leads to degrading terrorism and consequently achieve stability. This naturally includes the political powers, but there are also armed groups with whom we conducted a dialogue and reached agreements in troubled areas which have become quiet now. In other areas, these armed groups joined the Syrian Army and are fighting by its side, and some of their members fell martyrs. So, we talk to everyone except the organizations I mentioned like ISIS, al-Nusra, and similar ones for a simple reason which is that these organizations base their doctrine on terrorism. They are ideological organizations and are not simply opposed to the state as is the case with a number of armed groups. Their doctrine is based on terrorism, and consequently dialogue with such organizations cannot lead to any real result. We should fight and eradicate them completely and talking to them is absolutely futile. President Assad: Certainly with friendly countries, particularly Russia and Iran. Also we are cooperating with Iraq because it is facing the same type of terrorism. As for other countries, we have no veto on any country provided that it has the will to fight terrorism and not as they are doing in what is called “the international coalition” led by the United States. In fact, since this coalition started to operate, ISIS has been expanding. In other words, the coalition has failed and it has no real impact on the ground. At the same time, countries like Turkey, Qatar, Saudi Arabia, and Western countries which provide cover for terrorism like France, the United States, or others, cannot fight terrorism. You cannot be with and against terrorism at the same time. But if these countries decided to change their policies and realize that terrorism is like a scorpion, if you put it in your pocket, it will sting you. If that happens, we have no objection to cooperating with all these countries, provided that it is a real and not a fake coalition to fight terrorism. Question 6: What is the current condition of the Syrian Army? The Syrian Armed Forces have been fighting for over four years. Have they been exhausted by the war, or have they become stronger as a result of engagement in military operations? And are the reserve forces to support their activities? And I have another important question: you said that a large number of your former adversaries and adversaries of the Syrian Army have moved to your side and are fighting within the ranks of the government forces. What is their number? And what is the extent of the help they are extending in the fight against extremist groups? President Assad: Of course, war is bad. And any war is destructive, any war weakens any society and any army no matter how strong or rich a country is. But things cannot be assessed in this manner. War is supposed to unite society against the enemy. The army becomes the most important symbol for any society when there is an aggression against this country. Society embraces the army, and provides it with all the necessary support, including human resources, volunteers, conscripts, in order to defend the homeland. At the same time, war provides a great deal of expertise to any armed forces practically and militarily. So, there are always positive and negative aspects. We cannot say that the army becomes weaker or stronger. But in return, this social embrace and support for the army provides it with volunteers. So, in answer to your question. “Are there reserves?” Yes, certainly, for without such reserves, the army wouldn’t have been able to stand for four and a half years in a very tough war, particularly that the enemy we are fighting today has unlimited human supply. We have terrorist fighters from over 80 or 90 countries today. You talk about a popular incubator in the millions in different countries sending individuals to fight in Syria with the terrorists. As far as we are concerned, our reserve force is Syria in the first instance. So, we have reserve forces, and this is what enables us to carry on. There is also determination. We have reserves not only in terms of human power, but in will as well. We are more determined than before to fight and defend our country against terrorists. This is what led some fighters who used to fight the state in the beginning for different reasons, and then discovered that they are wrong, so they decided to join the state. Now they are fighting battles with the army, and some have actually joined the army as regular soldiers. Some of them have kept their weapons, but they are fighting in groups with the armed forces in different parts of Syria. Question 7: Mr. President, Russia has been fighting terrorism for 20 years, and we have seen its different manifestations. And now it seems that you are fighting it head on. In general, the world is witnessing now a new form of terrorism. In all the regions occupied by ISIS, they are setting up courts and administrations, and there are reports saying that it intends to mint its own currency. This way, they are constructing what looks like a state. This in itself might attract new supporters from different countries. Can you explain to us whom are you fighting? Is it a large group of terrorists or is it a new state which intends to radically redraw the borders of the region and the whole world? What is ISIS today? 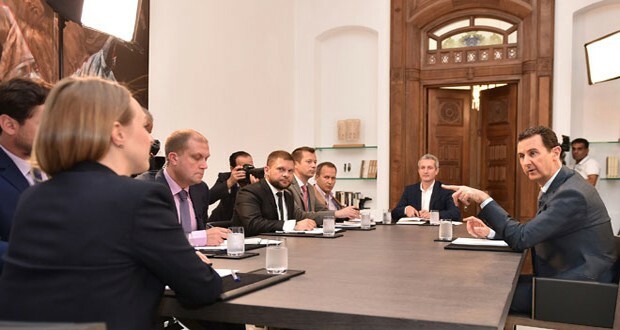 President Assad: Of course, the terrorist ISIS groups tried to give the semblance of a state, as you said, in order to attract more volunteers who live on the dreams of the past: that there was an Islamic state acting for the sake or religion. This ideal appearance is unreal. It is deceptive. But no state can suddenly bring a new form to any society. The state should be the product of its society. It should be a natural evolution of that society, to express it. In the end, a state should be a projection of its society. You cannot bring a state which has a different form and implant it in a society. Here we ask the question: does ISIS, or what they call the Islamic State, have any semblance to Syrian society? Certainly not. Of course we have terrorist groups, but they are not an expression of society. In Russia, you have terrorist groups today, but they do not project the Russian society, nor do they have any semblance to the open and diverse Russian society. That’s why if they tried to mint a currency or have stamps or passports, or have all these forms which indicate the existence of a state, it doesn’t mean that they exist as a state, first because they are different from the people, and second because people in those regions flee towards the real state, the Syrian state, the national state. Sometimes they fight them too. A very small minority believes these lies. They are certainly not a state, they are a terrorist group. But if we want to ask about who they are, let’s speak frankly. They are the third phase of the political or ideological poisons produced by the West, aimed at achieving political objectives. The first phase was the Muslim Brotherhood at the beginning of the last century. The second phase was Al Qaeda in Afghanistan in order to fight the Soviet Union. And the third phase is ISIS and al-Nusra Front and these groups. Who are ISIS? And who are these groups? They are simply extremist products of the West. Question 8: Mr. President, at the beginning of the Syrian crisis, the Kurdish issue started to be discussed more often. Previously, Damascus was severely criticized because of its position towards the Kurdish minority. But now, practically, in some areas, Kurdish formations are your allies in the fight against ISIS. Do you have a specific position towards who the Kurds are for you and who you are for them? 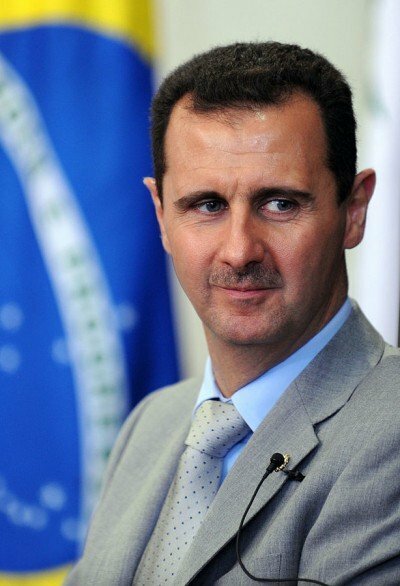 President Assad: First, you cannot say that there was a certain state policy concerning the Kurds. A state cannot discriminate between members of its population; otherwise, this will create division in the country. If we had been discriminating between the different components of society, the majority of these components wouldn’t have supported the state now, and the country would have disintegrated directly from the very beginning. For us, the Kurds are part of the Syrian fabric. They are not foreigners, they live in this region like the Arabs, the Circassians, the Armenians, and many other ethnicities and sects existing in Syria and living in it for many centuries. It’s not known when some of them came to this region. Without these groups, there wouldn’t have been a homogenous Syria. So, are they our allies today? No, they are patriotic people. But on the other hand, you cannot put all the Kurds in one category. Like any other Syrian component, there are different currents among them. They belong to different parties. There are those on the left and those on the right. There are tribes, and there are different groups. So, it is not objective to talk about the Kurds as one mass. There are certain Kurdish demands expressed by some parties, but there are no Kurdish demands for the Kurds. There are Kurds who are integrated fully into society; and I would like to stress that they are not allies at this stage, as some people would like to show. There are Kurdish soldiers in the army who have fallen martyrs, which means that they are fully integrated into society. But there are parties which had certain demands, and we addressed some of those demands at the beginning of the crisis. There are other demands which have nothing to do with the state, and which the state cannot address. There are things related to the whole people, to the constitution, and the people should endorse these demands before a decision can be taken by the state. In any case, anything proposed should be in the national framework. That’s why I say that we are with the Kurds, and with other components, all of us in alliance to fight terrorism. This is what I have talked about a while ago, that we should unite in order to fight ISIS. After we defeat ISIS, al-Nusra, and the terrorists, the Kurdish demands expressed by certain Kurdish parties can be discussed nationally. There is no problem with that, we do not have a veto on any demand as long as it is within the framework of Syria’s unity and the unity of the Syrian people and territory, fighting terrorism, Syrian diversity, and the freedom of this diversity in its ethnic, national, sectarian, and religious sense. Question 9: Mr. President, you partially answered this question, but I would like to have a more precise answer, because some of the Kurdish forces in Syria call for amending the constitution. For instance, setting up local administration and then moving on to an autonomy in the northern regions. These statements are becoming more frequent now that the Kurds are fighting ISIS with a certain degree of success. Do you agree to such statements? Can the Kurds bet on some kind of gratitude? Can this be discussed? President Assad: When we defend our country, we do not ask people to thank us. It is our natural duty to defend our country. If they deserve thanks, then every Syrian citizen defending his country deserves as much. But I believe that defending one’s country is a duty, and when you carry out your duty, you don’t need thanks. But what you have said is related to the Syrian constitution. Today, if you want to change the existing structure in your country, in Russia for instance, let’s say to redraw the borders of the republics, or give one republic authorities different from those given to other republics; this has nothing to do with the president or the government. This has to do with the constitution. The president does not own the constitution and the government does not own the constitution. Only the people own the constitution, and consequently changing the constitution means national dialogue. For us, we don’t have a problem with any demand. As a state, we do not have any objection to these issues as long as they do not infringe upon Syria’s unity and diversity and the freedom of its citizens. But if there are certain groups or sections in Syria which have certain demands, these demands should be in the national framework, and in dialogue with the Syrian political forces. When the Syrian people agree on taking steps of this kind, which have to do with federalism, autonomy, decentralization, or changing the whole political system, this needs to be agreed upon by the Syrian people, and consequently amending the constitution. This is why these groups need to convince the Syrian people of their proposals. In this case, they are not in dialogue with the state, but rather with the people. When the Syrian people decide to move in a certain direction, and to approve a certain step, we will naturally approve it. Question 13: Talking about alliances in the fight against terrorism and ISIS, Russian President Vladimir Putin called for a regional alliance to fight what is called the Islamic State, and the recent visits of Arab officials to Moscow come in this context, but Foreign Minister Walid al-Moallem said that this means a miracle. We are talking here about security coordination, as described by Damascus, in case it happened, with the governments of Jordan, Turkey, and Saudi Arabia. How do you see this alliance? In your opinion, will it achieve any results? You just said that any relation is based on interests, so are you willing to coordinate with these countries, and what is the truth behind the meetings held between Syrian and maybe Saudi officials as reported by the media? President Assad: As to fighting terrorism, this is a big and comprehensive issue which includes cultural and economic aspects. It obviously has security and military aspects as well. In terms of prevention, all the other aspects are more important than the security and military ones, but today, and in the reality we live now in terms of fighting terrorism, we are not facing terrorist groups, we are facing terrorist armies equipped with light, medium, and heavy weaponry. They have billions of dollars to recruit volunteers. The military and security aspects should be given priority at this stage. So, we think that this alliance should act in different areas, but to fight on the ground first. Naturally, this alliance should consist of states which believe in fighting terrorism and believe that their natural position should be against terrorism. In the current state of affairs, the person supporting terrorism cannot be the same person fighting terrorism. This is what these states are doing now. Saudi Arabia, Turkey, and Jordan, which pretend to be part of a coalition against terrorism in northern Syria actually support terrorism in the south, the north, and the northwest, virtually in the same regions in which they are supposed to be fighting terrorism. Once again I say that within the framework of public interest, if these states decided to go back to the right position, to go back to their sense and fight terrorism, naturally we will accept and cooperate with them and with others. We do not have a veto and we do not stick to anything in the past. Politics change all the time. It might change from bad to good, and the ally might become an adversary, and the adversary an ally. This is normal. When they fight against terrorism, we will cooperate with them. Question 14: Mr. President, now there is a huge wave of refugees, largely from Syria, going to Europe. Some say that these people are practically lost to Syria. They are very unhappy with the Syrian authorities because they haven’t been able to protect them and they had to leave their homes. How do you look at those people? Do you see them as part of the Syrian electorate in the future? Do you expect them to return? And the second question has to do with the European sense of guilt about the displacement happening now. Do you think that Europe is guilty in this regard? President Assad: Any person who leaves Syria constitutes a loss to the homeland, to be sure, regardless of the position or capabilities of that person. This of course does not include the terrorists. It includes all citizens in general with the exception of terrorists. So, yes, there is a great loss as a result of immigration. You raised a question related to the elections. Last year, we had presidential elections in Syria, and there were many refugees in different countries, particularly in Lebanon. According to Western propaganda, all those had fled the state, the oppression of the state, and the killing of the state, and they are supposed to be the enemies of the state. But the surprise for Westerners was that most of those voted for the president who is supposed to be killing them. That was a great blow to Western propaganda. Of course, voting has certain conditions. There should be an embassy, and to have the custodianship of the Syrian state of the voting process. This depends on relations between the states. Many countries have severed relations with Syria and closed Syrian embassies, and consequently Syrian citizens cannot vote in these countries. They should go to other countries where ballot boxes are installed. But this did happen last year. As to Europe, of course it’s guilty. Today, Europe is trying to say that Europe is guilty because they haven’t given money or they haven’t allowed these people to immigrate legally to Europe, and that’s why they came through the sea and were drowned. We are sad for every innocent victim, but is the victim who drowns in the sea dearer to us than the victim killed in Syria? Are they dearer than innocent people whose heads are cut by the terrorists? Can you feel sad for a child’s death in the sea and not for thousands of children who have been killed by the terrorists in Syria? And also for men, women, and the elderly? These European double standards are no longer acceptable. They have been flagrantly exposed. It doesn’t make sense to feel sad for the death of certain people and not for the death of others. The principles are the same. So, Europe is responsible because it supported terrorism, as I said a short while ago, and is still supporting terrorism and providing cover for them. It still calls them “moderate” and categorizes them into groups, while all these groups in Syria are extremists. Question 15: If you don’t mind, I would like to go back to the question about the political future of Syria. Mr. President, your opponents, whether those fighting against the authorities with weapons or your political opponents, still insist that one of the most important conditions for peace in the country is your departure from political life and from the position of the president of the republic. What do you think of this, not only in your capacity as president of the state, but as a Syrian citizen as well? Theoretically, are you prepared if you feel it is necessary? President Assad: In addition to what you are saying, Western propaganda was from the very beginning about the idea that the cause of the problem is the president. Why? Because they want to portray that the whole problem of Syria lies in one individual, and consequently the natural reaction for many people is that if the problem lies in one individual, that individual should not be more important than the whole homeland. So, let that individual go, and things will be all right. This is how they oversimplify things in the West. What’s happening in Syria, in this regard, is similar to what happened in your case. Notice what happened in the Western media since the coup d’état started in the Ukraine. What happened? President Putin was transformed from a friend of the West to a foe, and once again he was characterized as a tsar. He is portrayed as a dictator suppressing opposition in Russia, and that he came to power through undemocratic means, despite the fact that he was elected in democratic elections, and the West itself acknowledged that the elections were democratic. Now, it is no longer democratic. This is Western propaganda. They say that if the president went, things will become better. What does that mean practically? For the West, it means that as long as you are there, we will continue to support terrorism, because the Western principle followed now in Syria and Russia and other countries is changing presidents, changing states, or what they call bringing regimes down. Why? Because they do not accept partners, and they do not accept independent states. What is their problem with Russia? What is their problem with Syria? What is their problem with Iran? They are all independent countries. They want a certain individual to go and be replaced by someone who acts in their interests and not in the interest of his country. For us, the president comes through the people and through elections, and if he goes, he goes through the people. He doesn’t go as a result of an American decision, a Security Council decision, the Geneva conference or the Geneva communiqué. If the people want him to stay, he should stay; and if the people reject him, he should leave immediately. This is the principle according to which I look at this issue. Question 16: Military operations have been going on for over four years. You are likely to analyze things and look back often. In your opinion, was there a crucial juncture when you realized that war is unavoidable? And who initiated that war machinery? Is it the influence of Washington, or were they your Middle Eastern neighbors in the region? Or were there mistakes on your part? Are there things you regret? And if you had the opportunity to go back, would you change them? President Assad: In every state, there are mistakes, and mistakes might be made every day, but these mistakes do not constitute a crucial juncture because they are always there, so what is it that makes these mistakes suddenly lead to the situation we are living in Syria today? This doesn’t make sense. You might be surprised if I tell that the crucial juncture in what happened in Syria is something that many people wouldn’t even think about. It was the Iraq war in 2003, when the United States invaded Iraq. We were strongly opposed to that invasion, because we knew that things were moving in the direction of dividing societies and creating unrest. And we are Iraq’s neighbors. At that time, we saw that the war will turn Iraq into a sectarian country, into a society divided against itself. To the West of Syria there is another sectarian country, Lebanon. We are in the middle. We knew well that we will be affected. Consequently, the beginning of the Syrian crisis, or what happened in the beginning, was the natural result of that war and the sectarian situation in Iraq, part of which moved to Syria, and it was easy for them to incite some Syrian groups on sectarian grounds. The second point which might be less crucial is that when the West adopted terrorism officially in Afghanistan in the early 1980s and called terrorists at that time “freedom fighters,” and then in 2006 when the Islamic State appeared in Iraq under American sponsorship and they didn’t fight it. All these things together created the conditions for the unrest with the Western support and Gulf money, particularly form Qatar and Saudi Arabia, and with Turkish logistic support, particularly that Erdogan belongs intellectually to the Muslim Brotherhood. Consequently, he believes that if the situation changed in Syria, Egypt, and Iraq, it means the creation of a new sultanate, this time not an Ottoman sultanate, but a sultanate for the Brotherhood extending from the Atlantic to the Mediterranean and ruled by Erdogan. All these factors together brought things to what we have today. Once again, I say that there were mistakes, and mistakes always create gaps and weak points, but they are not sufficient and they do not justify what happened. And if these gaps and weak points are the cause, why didn’t they lead to revolutions in the Gulf States, particularly in Saudi Arabia which doesn’t know anything about democracy? The answer is self-evident, I believe. Mr. President, thank you for giving us the time and for your detailed answers to our questions. We know that in September you have your golden jubilee, your 50th birthday. Probably the best wishes in the current circumstances would be the return of peace and safety to your country as soon as possible.